With nearly half the Shana Aleph students in Poland with Rav Natanel and Rav Jake, we took the opportunity to plan two very special days with those students who remained in Eretz Yisrael. Wednesday’s tour was called “The 70 Faces of Jerusalem.” The day started with a visit to the international headquarters of Ichud Hatzala, where we heard the story of how a teenage boy began Hatzalah. He has created a unique organization staffed by Jewish, Christian and Moslem volunteers, who use modern technology to respond to emergency medical calls within 3 minutes of receiving a call. Next, Rav Cytrin took us back to the anxious days of May and June 1967, where we retraced the footsteps of paratroopers and followed them on their conquest of Ammunition Hill, a critical battle in the linking up with Israeli soldiers on Mount Scopus, and in the liberation of Jerusalem in 1967. 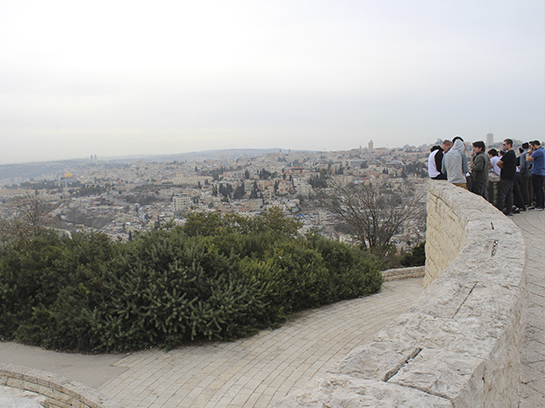 We ended the story at a viewpoint on Mount Scopus, overlooking the Temple Mount. There, we davened an inspired Mincha. Next stop for the day was a tour of the Belz Shul. Our guide Chezky regaled us with stories of the Hasidic Belz dynasty, and the story of their replanting in Eretz Yisrael after the devastation of the Holocaust, and answered our questions. We heard about the Belzer Rebbe’s determination to build a home for Hashem, and marveled at his 14-storey, $100 million dollar building. Every detail in this shul was planned with meticulous love and care by the Rebbe (he even joined in the physical labor at different points), and the result is a stunning, majestic building that combines beauty and aesthetics with Avodat Hashem. After spending the morning discussing Jerusalem’s past, we then moved our focus to the future of Jerusalem. We visited Mobileye, the Israeli hi-tech company which was recently purchased for $15 billion dollars (! ), and represents the burgeoning hi-tech culture developing in Jerusalem. Rabbi Mois Navon, a founding member of Mobileye gave us a tour of the company’s campus including a visit to the lab where the breakthrough Mobileye technology is developed! Our last stop of the day was at the brand new Pa’is Arena, to watch the local basketball heroes, HaPoel Jerusalem, match off against the Italian team Reggio Emilia. Watching the game was a blast. But we also met with Tamir Goodman in the VIP conference room. Tamir Goodman made headlines years ago as “the Jewish Jordan” and now lives in Jerusalem with his family. He told us the story of his high school and college career, and the challenges of being Orthodox and playing sports at the highest levels.